Many of you markets enthusiasts have loved CCP’s Chief Economist Dr. Ejyo’s periodic reports. They described a lot of neat EvE mechanics and events, including a number of indexes and markets analyses. With this little article I may show you how to get a “feeling” about the EvE markets, like when you’d read Dr. Ejyo reports. The first step is to gather data. This web site has provided a number of tools to make it simpler and automated: how to import EvE markets data into a trading platform, or how to automatically populate your EvE client market data cache with appropriate markets. They may be used to make yourself a picture of the EvE markets. 1) Open your market window. 2) Click on the “Price history” tab. 3) Make sure you have the chart enabled and not the table (the table works too but you need hawk eyes to notice what I want to let you see). 4) Make sure it’s set to “Year” (the last two options are to the bottom of the window). 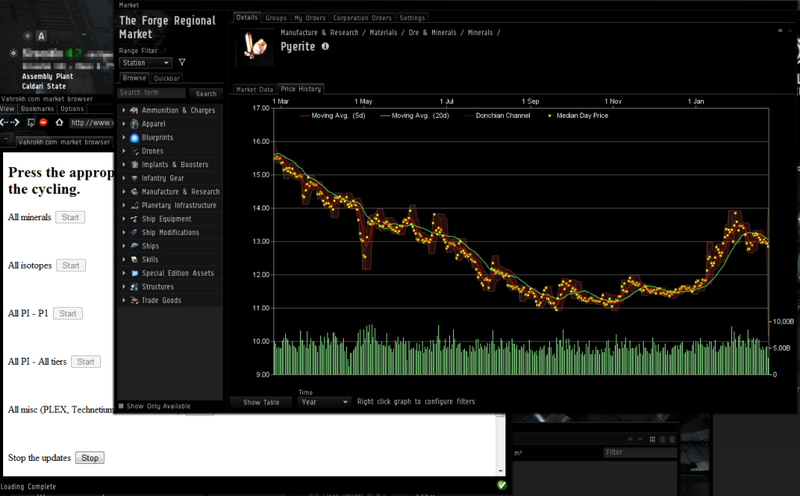 5) Now, leave the market window open and also open your in game browser (IGB). Only using the IGB will work. 7) Click all the options one by one except the PI related ones (they require more advanced training) and then press “Stop” when they have cycled once. In example, you pick “minerals”, wait for the minerals markets to finish cycling and return back to Tritanium then press “Stop” at the bottom of the page, next to the “Stop the updates” description. Then you go to the next buttons. Here is a screenshot showing my setup. It allows for markets browsing while also letting me start and stop the markets browsing at any moment. Hmm it seems like your site ate my first comment (it was super long) so I guess I’ll just sum it up what Ihad written and say, I’m thoroughly enjoying your blog. I as well am aan aspiring blog writer but I’m still new to everything. Do you have any tips for rookie blog writers?I’d certainly appreciate it. Talking about blog writing is a bit off-topic here. If you’d like to talk about it please PM me. I always emailed this webb site post page to all my friends, as if like to read it afterward my contacts will too. Greetings from Carolina! I’m bored to tears at work so I decided to browse your website on my iphone during lunch break. I love the knowledge you provide here and can’t wait to take a look when I get home. I’m amazed at how quick your blog loaded on my mobile .. I’m not even using WIFI, just 3G .. Anyways, very good blog!